The newest set of Magic: The Gathering is going to return players to the world of Ravnica and its powerful guilds who are all about doing very specific things. One of my favorite guilds, Izzet, is all about experimentation at the cost of anything—and I have some great preview cards to show you that deal with that experimentation. The first guy is a reprinted card from an older set. The Goblin Electromancer is the kind of person who is out in the world making things cheaper and easier for everyone else, and really that’s just its way of encouraging experimentation. Once you start discounting the costs of cards, you can cast so many more spells! 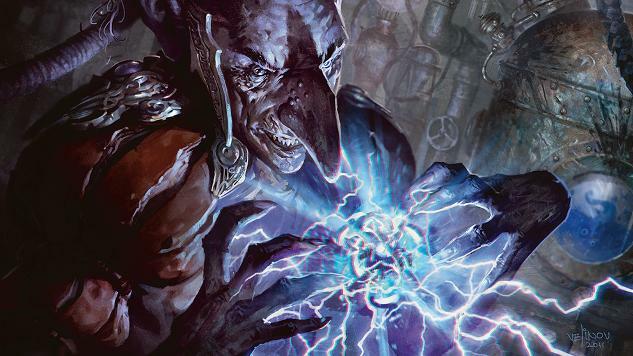 Along with Baral, the Goblin Electromancer has been tearing up a storm in Magic’s non-rotating Modern format recently in the Storm deck, and maybe we can experience a little bit of that deck’s mischief in the upcoming Standard format. After all, that Electromancer needs to do some ‘mancy, as you can tell by its grimace delivered in the art by Svetlin Velinov. One of the ways that the Electromancer might try to get his mad scientist on is through a little bit of direct current. Direct Current is a weird card. Doing two damage for three mana at the slow speed of a Sorcery is basically all of the pieces that you need to create a bad Magic card, but what makes this one special is the new ability “jump-start.” It means that you can cast the card and then play it again from the graveyard as long as you have a land to throw away, and in the late game of any given Magic match, you’re going to have lands to throw away and mana to spend. It’s all in the spirit of experimentation, of course, so I think we should probably think about Direct Current as a utility spell that helps deal an extra bit of damage at the end of the game or that clears up a blocker after combat. It is a tool in a toolkit, not a damage spell that wins a game on its own. It makes sense, really, as artist Dan Scott depicts it as something that helps an experiment get along, not an experiment in and of itself. Plus, Goblin Electromancer makes it cheaper. Based on these two cards, I’m excited to see what the scientists in the Izzet guild are going to be cooking up in Guilds of Ravnica, which releases on October 5. Cameron Kunzelman tweets at @ckunzelman and writes about games at thiscageisworms.com. His latest game, Epanalepsis, is available on Steam.